It is, I think, uncontroversial to consider the VL3000 spot fixture as having a special place of prestige among intelligent fixtures. 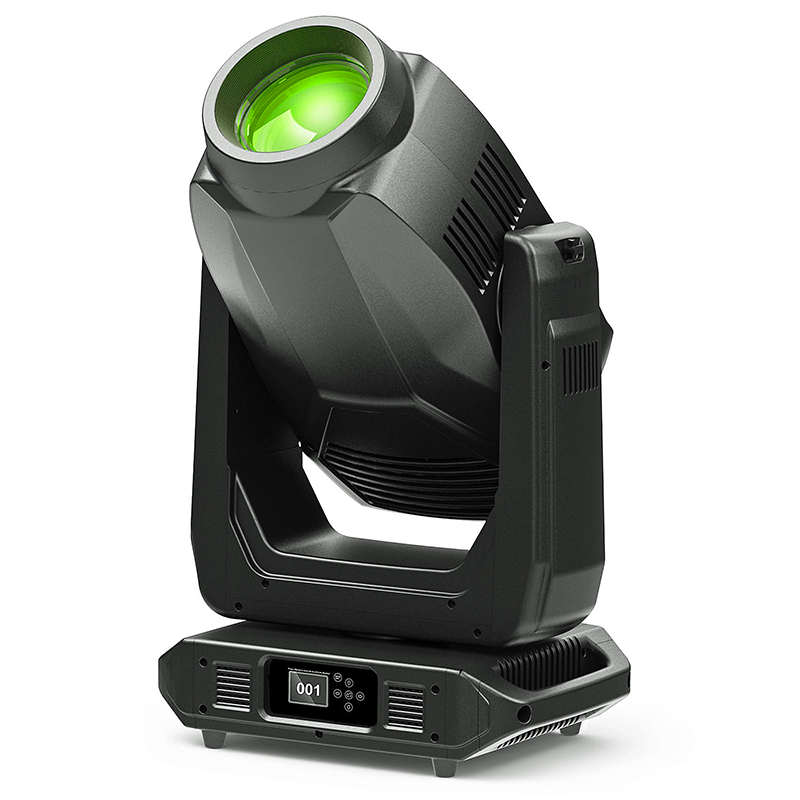 In that 1200-watt fixture Vari-Lite realized a truly excellent light, one that set the standard for the quality of its brightness, effects and optics, and it has been used extensively in entertainment lighting since its inception. It was, to understate things, a very usable intelligent light. But LED technology marches ever onward to challenge the dominance of arc-lamp based luminaries, with no sign of retreat. Once a storied dream, today’s high-efficiency LED spots rival even the brightest arc-based lights, and the latest offering from Philips Vari-Lite, the VLZ Spot, is no exception. The source for this light is a closed-box 620-watt LED engine from Appotronics, with a native color temperature of 8,000 Kelvin. The optics knock this down to a CCT of 7,640 Kelvin at the final output, and there’s a linear CTO that smoothly adjusts this down to 3,200 Kelvin. I measured 8,590 lux at five meters at 50 percent zoom after letting the fixture warm up at full power for 20 minutes. As with most LED-based spot fixtures that I’ve reviewed, a significant amount of the fixture’s physical space is devoted to cooling. LED performance degrades as temperature increases, so it’s critical to keep your dies cool. Accordingly, there’s a large heat sink and copper heat pipes that surround the LED module at the rear of the light. These performed admirably, and I measured a thermal output drop of only 2 percent (which fluctuated up or down slightly), down from an initial value of 8,760 lux. This is an impressive number; clearly a lot of thought went into the thermal management. Vari-Lite tells me they haven’t had to replace an LED engine yet, but told me that, for the sake of fixture longevity, the engine is designed to be easily swapped. The dimming in this light is completely electronic; no mechanical dimmer is present. The dimming curve very closely matches an ideal square law curve (see graphic), and different curves are selectable within the menu system for different applications. The dimming was very smooth, even down to the last few clicks before blackout. Incoming data is interpolated and smoothed, with a very slight fade time even with a zero-time snap to black on the dimmer channel, just like a real mechanical dimmer. Alternatively, the strobe channel makes the light instantly turn off without any fade time. Expected strobe functions are here, including constant-rate flashes, random strobes and pulses. Evenness across the projected field was good, with acceptable center-to-edge difference. Immediately after the LED engine is the color mixing module. This uses a flag system with opposing color flags that close across the aperture like a pair of curtains, and they have a very finely etched pattern on the leading edge to make the color change more gradual. This patterning is slightly different on each pair of flags, which I suspect is to make them easier to identify after the user takes them out for maintenance or cleaning. Like all flag systems, there are areas in the focus range that are better for beam homogeneity with regards to color mixing. All color mix systems have trade-offs between saturation, evenness and speed, so this is expected. Flag-style color mix systems usually indicate a priority for speed, and this one is nicely responsive. The yellow is quite warm, almost amber; a decision VL tells me was made to compensate for the higher color temperature of the LED source as compared to an arc lamp. There is also a variable CTO channel to change your color temperature. Next in line is the gobo module, which also has the two fixed color wheels, each with six colors plus open. These include colors that help to fill in the gaps of the mix system, including a “cooler” yellow, a deep saturated red and a minus green. Gaps between adjacent colors are small, with split colors working well. There are two gobos wheels, each with seven patterns plus open, all indexable and rotatable. All are glass, mostly patterns optimized for aerial projection and effects, but with a few that could be used for breakups on scenery or actors. The gobos all use the familiar slot-and-lock system, with patterns riding in a carriage and held in with a circular spring for easy user replacement. Gobos rotate smoothly down to the slowest speeds and also include shake, rocker effects and “Mega Stepping,” which is an 8-bit-looking “steppy” movement. Center-to-edge gobo focus was excellent, with very little chromatic aberration or spherical distortion. Movement on all wheels was quite snappy. This module also includes the iris for beam size reduction. Both the color and gobo modules removed easily from the light with two non-captive screws each. Next are the zoom and focus lens groups, along with armatures for the frost and prisms. Zoom ranges from 7° to 50°, and the fixture covers its range in 0.7 seconds. Like some other spot fixtures I’ve seen recently, the manufacturer has prioritized breadth of range for the zoom function, and there is no way to focus down on gobos at the very narrowest ends of the range — be aware of this when programming. There is an iris function that can get the beam down to a pin spot, but will not fade to black. There are no framing shutters in this model. The frost system consists of two separate filters, which are on separate armatures controlled by a single channel. The first, lighter frost inserts first, followed (as the user increases the value on the channel) by the system swapping it out for the heavier frost, then, finally, inserting both at the same time. These transitions are not discreet — you can’t gradually slide the filter into place — and insertion is fast enough to use as an effect. These frost filters are moderately heavy. The first leaves a little of the gobos intact, with very indistinct edges. The second and third levels are more like a wash effect than gobo softening. An armature for the prism is opposite the frost filters and on the same plane perpendicular to the LED engine — in other words, you can’t use both the frost and the prism at the same time. This is a basic three-facet circular prism, and it provides good image separation as well as indexing and rotating. Like all prisms, it can accentuate the unevenness of half-mixed colors, but this is expected. The fixture restricts where in the zoom range the frost and prisms can be inserted, to avoid bumping into the zoom and focus elements. Pan and tilt ranges are 540° and 270° and cover their ranges in 4.2 and 2.4 seconds, respectively, with very smooth movements even during long-duration moves. Power input is via Neutrik PowerCON TRUE1, and input voltage auto-ranges from 100-240 VAC. Power-on from a cold start took 1:05 minutes. DMX is accepted via 5-pin XLR ins and pass-throughs and Art-Net via EtherCON in and pass-throughs. The fixture weights 97 pounds and stands 32 inches tall, with a base measuring 18 by 12.6 inches. The front of the fixture features a color menu system for setting fixture modes and options. Rigging is via the familiar “rails” from other Vari-Lite products, which fit your choice of rigging hardware. This light represents a solid offering from one of the oldest automated lighting manufacturers around; designed as a successor to one of the most successful 1200-watt automated fixtures. While it doesn’t attempt to dazzle with a lot of gags, where it succeeds is in the quality of the effects and design as a workhorse fixture from start to finish.